Original Vitakraft Crackers are pure flavour and entertainment in one. Your dwarf rabbit can nibble away to its heart's content. The delicious seed mix is specially formulated for dwarf rabbits and contains healthy vitamins for a healthy rabbit's life. Triple baking the treat in the Vitakraft bakery guarantees extra long nibbling fun for your pet. The wooden stick inside the crackers helps with the natural abrasion of the teeth. Vitacraft Crackers Trio-Mix provides a bit of variety. 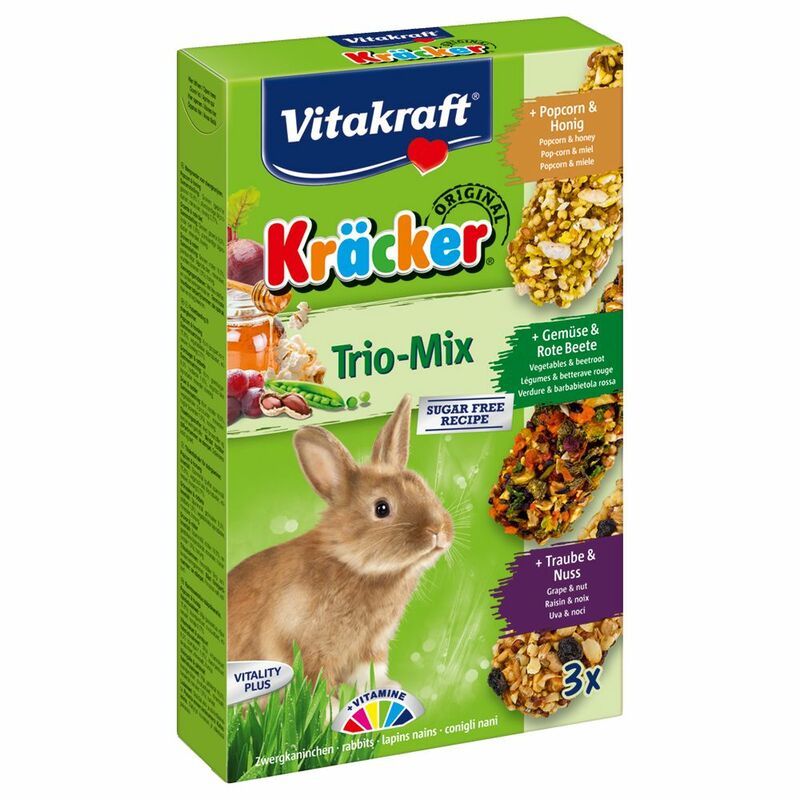 Each Trio-Mix set contains 3 different flavours: Trio-Mix with Vegetables and Beetroot, Grapes and Nuts and Forest and Elderberries or Trio-Mix with Popcorn and Honey, Vegetables and Beetroot and Grapes and Nuts. Vitakraft Dwarf Rabbit Cracker Sticks Trio-Mix at a glance: Made specifically for dwarf rabbits A sugar-free recipe With healthy vitamins Triple-baked onto an untreated wooden stick Comes with clips for attachment Contents: Trio-Mix Vegetables and Beetroot /Grapes and Nuts / Forest and Elderberries (168g): 1 x Vegetables and Beetroot cracker, 1 x Grapes and Nuts cracker, 1 x Forest and Elderberries cracker Trio-Mix Popcorn and Honey / Vegetables and Beetroot / Grapes and Nuts (160g): 1 x Popcorn and Honey cracker, 1 x Vegetables and Beetroot cracker, 1 x Grapes and Nuts cracker.